A memorial to a “colourful character” who died two years ago has been installed after a weekly newspaper’s campaign. 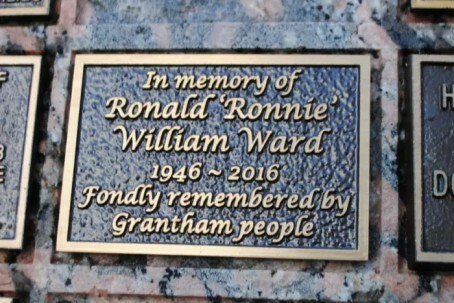 The Grantham Journal launched a bid to raise funds for a permanent memorial to Ronnie Ward, a well-known figure in Grantham town centre, following his death the previous year. The Journal had revealed that Ronnie’s death, his body had remained in the mortuary at Queen’s Medical Centre, Nottingham, for seven months until the local authority agreed to pay for his cremation after his surviving relatives failed to hold a funeral for him. The service was attended by around 30 well-wishers wearing bright clothing or headwear, in tribute to Ronnie who, according to the Journal, “was often be seen strolling through the town centre wearing multi-coloured mohican headwear and bright ties”. The paper’s appeal for a more permanent memorial raised £702, and a plaque has now been installed at Grantham Crematorium as a result. Journal editor Marie Bond said: “Readers really got behind our fund-raising appeal and it is thanks to them that this lasting memorial to Ronnie is possible.